Some countries in northern and eastern Africa will grow into important markets for solar thermal products in the coming years: This was a statement the majority of the 58 export-orientated technology suppliers participating in a global survey from November to December 2018 (see the chart below) could get behind. The percentage of suppliers agreeing with the above was about the same regardless of whether they were based in or outside Europe. The reasons for the positive outlook were manifold. You can see more results from the survey carried out by German market research agency solrico here and here. The attached pdf lists all the 78 companies that responded to the survey (Photo: Papaemmanouel). 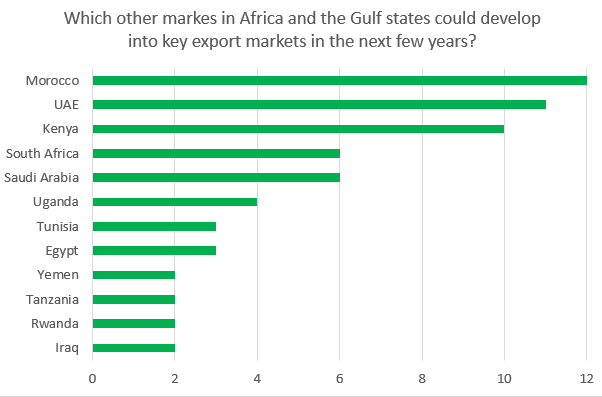 Morocco, United Arab Emirates and Kenya were the most-named markets in Africa and the Gulf region when it came to bright prospects for export growth (see the chart below). The SWH suppliers described Morocco as a “quality-orientated market”, which showed a “favourable attitude towards renewable energies”. The country is experiencing a 6 % annual increase in demand for energy, with a 95 % dependence on imports. One reason for growing demand in the UAE, according to the respondents, was “the implementation of new mandatory rules on solar water heating in newbuilds”. Dubai is leading the emirates in solar thermal sales. In March 2012, it stipulated that newly built hotels, workers’ dwellings, privately owned villas, shopping centres and public buildings managed by a single legal entity had to use solar energy to meet at least 75 % of annual hot water demand, provided enough roof space was available. Likewise, solar irradiation levels are between two and three times higher than in Europe, so that the payback period for solar thermal systems is shorter, especially if they replace electric water heaters. Saudi Arabia is expected to follow the example of Dubai in implementing mandatory rules, and since its construction industry is booming too, it is seen as a key export market for the future. Kenya grabbed the attention of internationally operating solar water heater manufacturers in 2012, when it launched an SWH initiative. The resulting regulations have since stipulated that solar thermal systems must supply at least 60 % of the hot water used in new, extended or retrofitted commercial or residential buildings. The rules, however, apply only to buildings that require over 100 litres a day. It should be noted that last May, a property developer filed a lawsuit questioning the legality of the requirements. Data supplied by the Kenya Revenue Authority (KRA) shows that 1,362 solar thermal systems were imported in 2016 and early 2017. Increasing prices for fuel, which have left Yemenis with only one option: to use solar energy.